'The Ballymaloe Bellini' - Meyer Fonne Cremant d'Alsace Brut Extra with a touch of Elderflower Cordial - a lovely summer welcome! For the fish course - Meyer Fonne Pinot Blanc Vielles Vignes 2013, Alsace - "a lavish, full-bodied white with rounded honey flavours over hints of apricot, touches of lemon and a fine, medium length, clean finish"
For the ham course - La Stoppa Trebbiolo Emilia Rosso, Emilia Romagna 2012 - "juicy and lush...with notes of cherry, red berries mingle with wild notes of blackcurrants, fig, prunes, mulberry, plum..."
For dessert - Clos Uroulat, Jurançon, SW France 2012 - "..lovely, dense, honeyed sweetness. Full, rounded, minerally, quiet soft and open but with good acidity and an overall delicious style"
One of the chief purposes of this annual event is to give recognition and exposure to not only our own growers, but also the many Irish artisan food producers, suppliers and chefs who are striving to provide us with the finest quality organic food products. Ballymaloe Cookery School has long-established relationships with many of these producers in the Cork area and beyond, and we are delighted to welcome them to the Long Table Dinner each year. 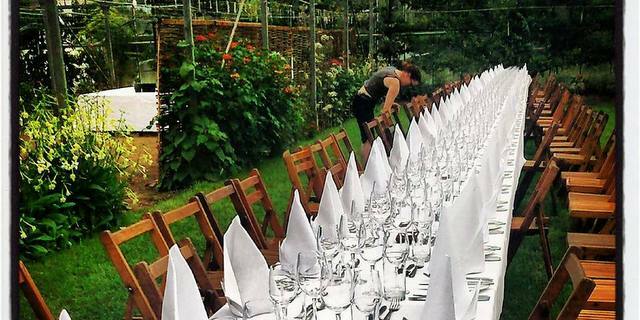 Proceeds from the Long Table Dinner in the Glasshouse benefit the East Cork Slow Food Educational Project.